The BASIC Stamp is an electronic microcontroller made by Parallax, a company started by two kids fresh out of high school in 1986. A BASIC Stamp is an essentially complete, self-contained computer system. Depending on the model, the Stamp (as it’s usually called) is either a single chip or a small circuit board. 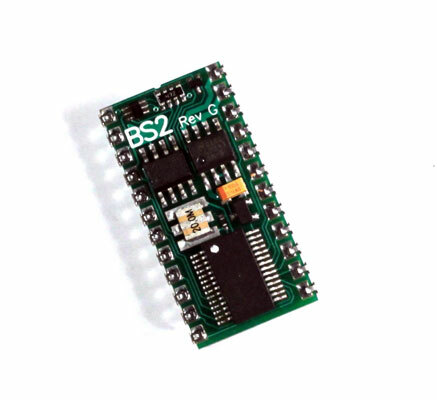 The key feature that sets BASIC Stamp microcontrollers apart from other microcontrollers is that BASIC Stamps include a built-in programming language called PBASIC (Parallax’s modified version of BASIC). This programming language makes it easy to create programs that run on the BASIC Stamp. With most other microcontrollers, programming is much more difficult because you must write the programs in a more complicated programming language. Here is the Basic Stamp 2 Module. This is a complete computer system on a 24-pin DIP package that you can solder directly to a circuit board or (more likely) insert into a 24-pin DIP socket. Maximum I/O pin current: 20 mA. (However, there is a limit of to the total amount of current the I/O pins combined can handle: 40mA for the first group of 8 I/O pins and another 40mA for the second group.